Children with autism (ASD) do not respond to conventional methods of education due to their unique patterns of thinking and responding to the world. They require specialist intervention in the form of adapted teaching methods and the use of tailored resources. The majority of skilled professionals have almost none of the requisite knowledge and skills to address the needs of these learners. 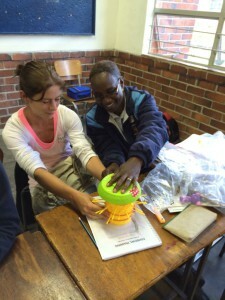 The Fishbowl Autism Skills Development Programme was developed at the Children’s disABILITY Training Centre in Johannesburg due to the high demand for specialised hands-on training for educators, therapists, parents and carers who work with children in the Autism Spectrum in South Africa. The course aims to empower these individuals by identifying their strengths and enabling them to provide individualised intervention at each child’s level of understanding. Developed by highly skilled educators with many years of autism-specific experience both locally and internationally, the course has been designed for particular implementation in the South African context and embodies a balance between theory and practical application. It addresses the various areas of developmental delay, including communication and language development, motor skills, sensory functioning, social and emotional development as well as life skills. The Fishbowl Skills Development Programme has been extremely well received by the teachers, therapists and parents. Over 3000 delegates have attended the course throughout South Africa and our neighbouring countries since its inception in 2012, with training feedback indicating that they obtained a greater understanding and awareness of the disability and felt more empowered in their ability to manage and support children who suffer from Autism. In 2014 Children’s disAbility Training Centre had a total of 7 Fishbowl training courses in the following places; Richards Bay, Durban (both KZN Province), Johannesburg (2 times), Harare (Zimbabwe), Mbombela (Mpumalanga Province) and Polokwane (Limpopo Province). A total of 131 professionals were trained in these areas. In 2015 plans are in place to train in all the 9 provinces of South Africa and CdTC have already trained in Katlehong (Gauteng Province). We have confirmed dates and venues for Port Elizabeth; 9th t0 the 13th of February (Eastern Cape), Cape Town; 23rd to the 27th of February (Western Cape) and Witbank; 16th to 20th March (Mpumalanga Province) and we are in touch with other provinces to secure venues for the other remaining Fishbowls. We have developed pre-training and a post-training evaluation forms which will help us gauge how much knowledge our participants have about autism prior to the training and after the training to determine to what extent their knowledge of ASD increased. We would also want to use the evaluation forms to improve both the content of our training and our teaching methodologies to cater for and meet the needs of our participants. The training in all venues will take place subject to 20 or more participants registering for the course. Please indicate which venue would best suit you to enable us to plan accordingly. Day One started at 9am not at the scheduled time of 8am because most of the participants had not arrived by then. The Principal of the school (Ezibeleni LSEN School) addressed the participants and wished them a successful training week. After that the trainers addressed the participants and explained how the programme would run and asked them to complete a pre-training evaluation form to find out how much autism knowledge they had. The trainers then began with the introduction to Autism Spectrum Disorder and then covered all the topics for Day 1. The participants were fired up right from the beginning, asking pertinent questions such as what causes ASD. On the second day training began at 8am as scheduled because participants arrived on time. They did theory and a practical on independent learning. A lot of theory was also covered on Observation, Adapted Curriculum and Adapting for success. Participants were very interactive, asking relevant questions. Most of day 3 was about how to communicate with non-verbal children/learners. The participants indicated that communicating with non-verbal learners was very difficult and it resulted in the learners getting frustrated because they cannot put across their wants or how they feel. Practical on how to use various communication methods were done and the participants were very interactive throughout. The other interesting topic that was covered was sensory processing and what surprised most participants is to learn how learners with autism may be very sensitive to things that never bother us and that, that has a bearing on their learning as well as behaviour. Day 4 covered Sociability and how Social stories can be used to help children adapt their behaviour. Social skills development was also covered and ways of supporting learners’ emotional development was discussed. On the last day we discussed ways of understanding and managing challenging behaviour, an areas where most educators battle. They enjoyed this topic because it gave them practical ways of handling these behaviours. Another topic that was covered was how to promote independence among learners with autism, from the most basic to the complex skills. Participants were very enthusiastic and they indicated that they could not wait to implement and try out the new strategies that they had acquired. They also said they wished more people could attend such training as it is an eye opener and it will benefit the educators and consequently the children. They also wished parents and the community could also be trained for them to understand the possibilities and limitations that children with autism have.